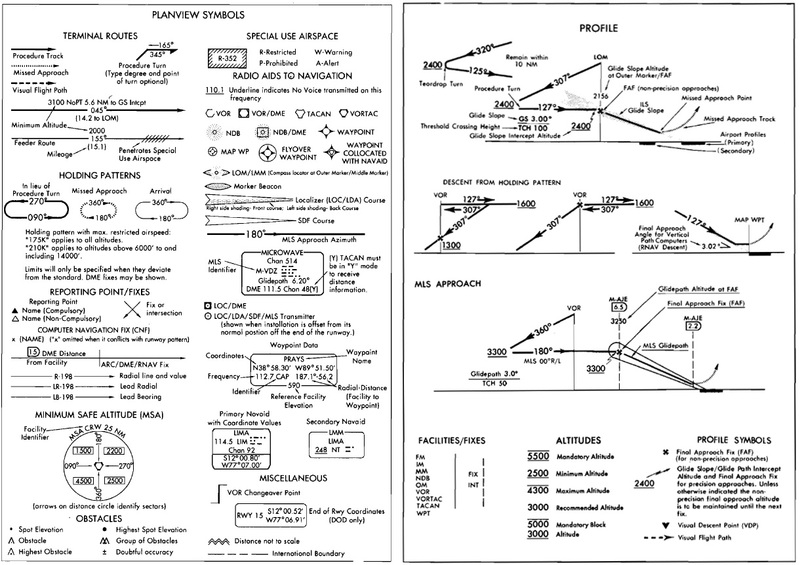 "Instrument Approach Procedure (IAP) Charts. IAP charts portray the aeronautical data that is required to execute instrument approaches to airports. 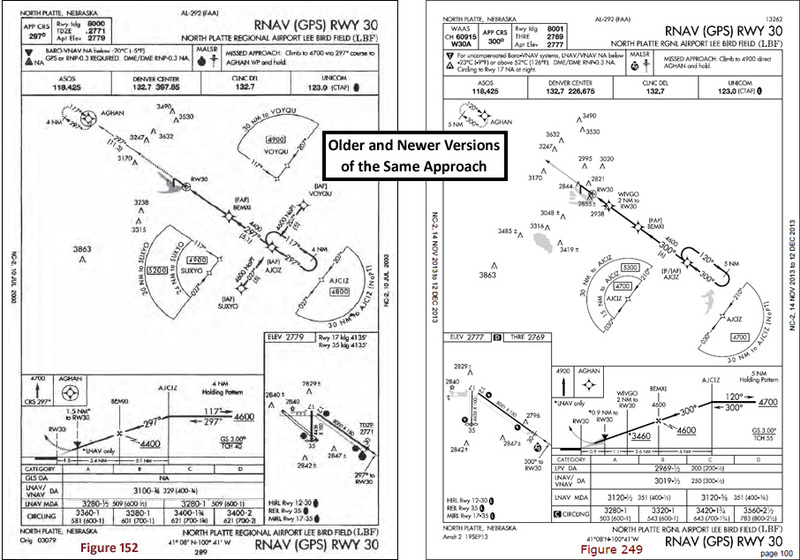 Each chart depicts the IAP, all related navigation data, communications information, and an airport sketch. Each procedure is designated for use with a specific electronic navigational aid, such as ILS, VOR, NDB, RNAV, etc." Precision Approach: An instrument approach procedure using precision lateral and vertical guidance. An ILS is an example of a precision approach. Its vertical guidance is provided by the glide slope. Non-precision Approach: Any instrument approach that is not considered "precision". They are typically noted by a lack of a vertical guidance component. Even though some WAAS-based approaches include vertical guidance (glide path), they are not considered to be precision approaches. DA - Decision altitude: The altitude defined in a chart's minima section representing the point where the pilot must have visual contact with the runway, runway environment, or lights to continue to a landing. Without this visual contact, the pilot must execute the missed approach procedure. The pilot, thus, makes a decision at the decision altitude: either land or go missed. MDA - Minimum Descent Altitude: The altitude defined in a chart's minima section and profile view representing the lowest altitude to which the pilot may descend on a specific approach segment. The FAA has changed the benchmark on this several times over the years. Older charts may show either TDZE (touchdown zone elevation) or THRE (threshold elevation), depending on when they were printed. The Testing Supplement has examples of both. Currently, approach charts use TDZE, but be aware that either may appear in the test. Approach minima are divided into lettered categories: A, B, C, and D. These are based on a referential airspeed for the aircraft, usually 1.3 times Vso at maximum gross weight. A pilot may fly an approach at a speed in a higher category, using the minima for that higher category. A pilot may fly an approach at a speed in a lower category, but must still use the minima of the authorized category. That is, a pilot may not fly in a lower category in order to use lower minima. Click here to view this important lesson on GPS with WAAS. Adobe Flash is required. Instrument approaches may not be completed for a variety of reasons such as loss of navigation or weather existing below the allowable minimums. A missed approach procedure is executed by the pilot when an approach must be discontinued. This involves navigating (if possible) to the missed approach point (MAP) if not already there, beginning a prescribed climb, and navigating to a prescribed point where a holding procedure is normally performed. On an approach chart, the missed approach instructions are displayed in several places. They are described in text inside of a box at the upper right. They are also shown as dashed lines within the plan and profile views. On a precision approach such as an ILS, the MAP exists at the point on the glide slope where DA (decision altitude) occurs. A procedure turn is the maneuver prescribed when it is necessary to reverse direction to establish the aircraft inbound on an intermediate or final approach course. The procedure turn or hold-in-lieu-of-PT is a required maneuver when it is depicted on the approach chart. 1. The pilot has been cleared for a straight in approach. 2. The "No PT" symbol is depicted on the segment being used. 3. When a radar vector to the final approach course has been provided. 4. When conducting a timed approach from a holding fix. In the real world, if you aren't sure if the procedure turn is required or expected, ask the controller. If TSO-C129 equipment is used to solely satisfy the RNAV requirement, GPS RAIM ability must be confirmed for the route of the flight. If a RAIM failure occurs prior to the FAF (final approach fix) the approach should not be completed using GPS. If a RAIM failure occurs after reaching the FAF a missed approach should be executed. In approach mode, the sensitivity on the CDI changes from 1 NM to 0.3 NM within 2 NM of the FAF. Pilots should avoid requesting or accepting vectors from ATC that cause them to intercept the approach course within 2 NM of the FAF since this may prevent the normal change to approach sensitivity. Warning: The Knowledge Testing Supplement has duplicate versions of some instrument approach charts. Taken from different times these will contain some important differences. Make sure that you are looking at the correct chart. APV Approaches: APV stands for "Approaches with Vertical Guidance". These include a system generated glide path that is similar to the glide slope in an ILS. 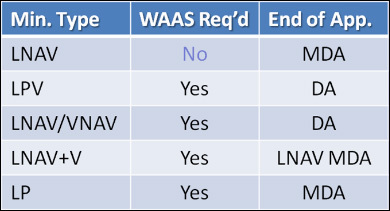 APV approaches are only available with WAAS-enabled systems.